→ProTypers Review – $200 Per Month Solving CAPTCHAS? 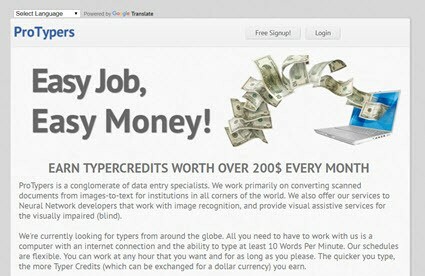 ProTypers Review – $200 Per Month Solving CAPTCHAS? In this review, I would like to cover all you need to know about ProTypers, so check this out before you join! By the way, if you want to discover the proven method that earns me $1,000+ per month from my laptop, check out my #1 recommendation. In the homepage, they make you believe that you will help institutions convert digitalize documents as well contribute to the visually impaired. However, after you sign up, you will discover ProTypers is all about you solving CAPTCHAS, which basically means typing what you see on the image. So, your job is to solve CAPTCHAs as fast as you can because the quicker you type, the more you earn. You should type at least 10 words per minute otherwise you can get banned. You probably solved a CAPTCHA when you tried to log in to a website or submit information online. A CAPTCHA is a test used on websites to block spammers and bots that try to get automatic access, send unlimited messages, and exploit systems. There are many payment methods to choose from. No clear explanation why you are doing this job. They will ban your account if you don’t type fast and accurately. There is no guarantee you will get paid. Why Are You Solving CAPTCHAS? MegaTypers doesn’t explain why you are solving these CAPTCHAS, but I suspect this activity may benefit automated system to help hackers and spammers. I can’t think of any other reason a person or a company would pay others to do that. The purpose of a CAPTCHA is to block automated logins or messages to exploit systems. So, any attempt to bypass that system can be seen as a highly suspicious activity. The registration is free, and you must provide your name, email, and payment type. To start solving CAPTCHAS, you just need to click on “Start Working” located on the left sidebar. Then, you will have 15 seconds to solve each image. You need to type fast and accurately. The reason being that if you take longer than 15 seconds, you will be kicked, and if that happens more than 10 times in 24 hours, they will ban your account. Accuracy is similarly crucial as Protypers threatens to suspend your account if you make a lot of typing mistakes. Also, if you submit incorrect answers, they will deduct from the TyperPoints you have already earned. Without these pages, you don’t really know what to expect from the relationship between you and Protypers. They can simply delete your account, ignore your payment and even abuse your data privacy. ProTypers claims top earners make between $100 and $250 per month. Well, don’t believe that! In my opinion, you will work like a dog doing this repetitive job for less than $20 per month. What’s worse, there is a chance you won’t get paid because ProTypers is not enforced by law to pay anyone. Unfortunately, there are no guarantees! To have an idea of how much you can earn, check out the latest statistics table, which shows the payout rates per 1,000 CAPTCHAS. As you can see, the payout depends on the time of the day you are working. The maximum you can earn is 0.90$TC per 1000 images from 14:00 – 15:00. $TC stands for Typer Credits, but what is a Typer Credit? Well, they don’t mention how much 1.00$TC is worth in dollars, but I suppose it’s 1 USD. I decided to give it a try and made 0.02$TC in 4 minutes. So, I would have to work 3.3 hours to make only 1.00$TC. Another drawback is that some CAPTCHAS are tricky to solve, so it’s easy to make mistakes and eventually be suspended. In addition to Typer Credits, you will also earn Typer Points if you solve at least 500 correct CAPTCHAS in 1 day. 1 Typer Point = 1 cent, which is nothing but you will need at least 50 Typer Points as a minimum requirement to cash out. Have at least 50 TyperPoints. You can choose to redeem Typer Credits via PayPal, Perfect Money, Payza, Western Union, Webmoney, Bitcoin, and Litecoin. Conclusion – Is ProTypers a Scam? I can’t prove ProTypers is a scam, so I just can’t make such a claim here. Regardless, I don’t think it’s worth doing such a tedious and unfulfilling job for such an extremely low pay. What’s worse, you can work hours and hours only to have your account suspended for any reason. Why work for other people for such low pay when you can build your own online business and eventually achieve time and location freedom? I started my website 3 years ago, and I have to confess it was not easy to attract a large audience and start making money. However, I knew that all my hard work would pay off eventually. So, I pushed hard and now the site generates over $1,000 in passive income per month. My job is to write helpful content that people are searching for on the internet. It’s a solid strategy that internet marketers have been using for decades to rank sites on Google. I started as a complete newbie, but thanks to this excellent step by step program developed by Kyle and Carson, I learned the ropes. You can join for free and watch the first 10 lessons to learn about the overall business strategy. Give it a shot with no strings attached and see if you like. I hope this Protypers review was helpful to you. If you have any questions, please let me know in the comment section below.